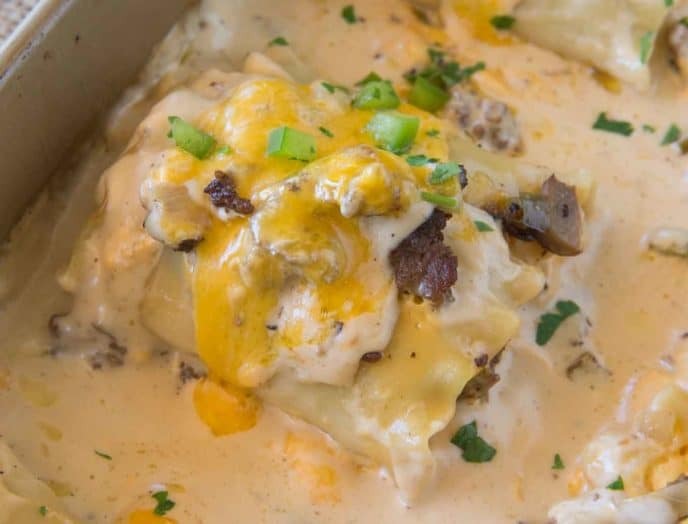 Philly Cheesesteak Lasagna Roll Ups with a beefy bechamel sauce, ground beef, cheddar cheese, mushrooms and onions for a new cheesesteak you’ll love! We’ve got lasagna on the mind with the recent Chicken Cordon Bleu Lasagna, Ultimate Meat Lasagna and Slow Cooker Lasagna. 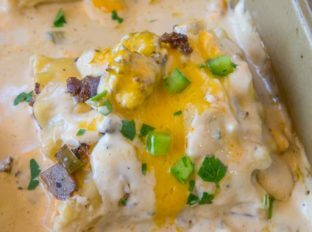 We love all things Philly Cheesesteak around here as evidenced by the dozen or so recipes that we’ve made to enjoy those classic flavors. 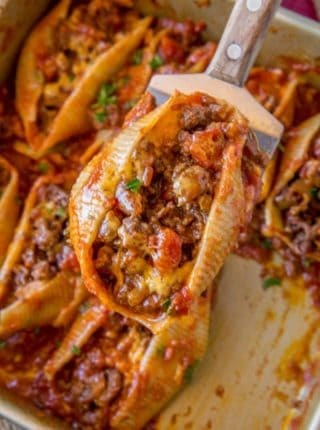 These lasagna roll ups are the saucier cousin to the crazy viral Philly Cheesesteak Stuffed Shells that you may have seen going viral on pinterest and facebook. 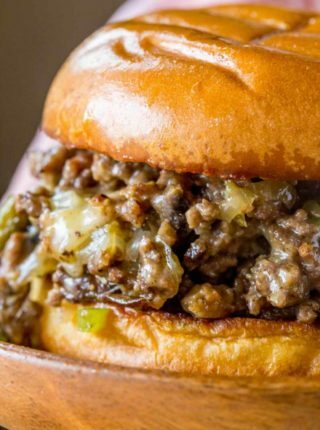 And if you want two of my favorite recipes of all time, these are legitimately my two favorite: Philly Cheese Steak Sloppy Joes and Slow Cooker Philly Cheese Steak Sandwiches. I could eat them every day, forever and ever. Well until I outgrew all the black yoga pants on the market, haha. Why make lasagna roll up? 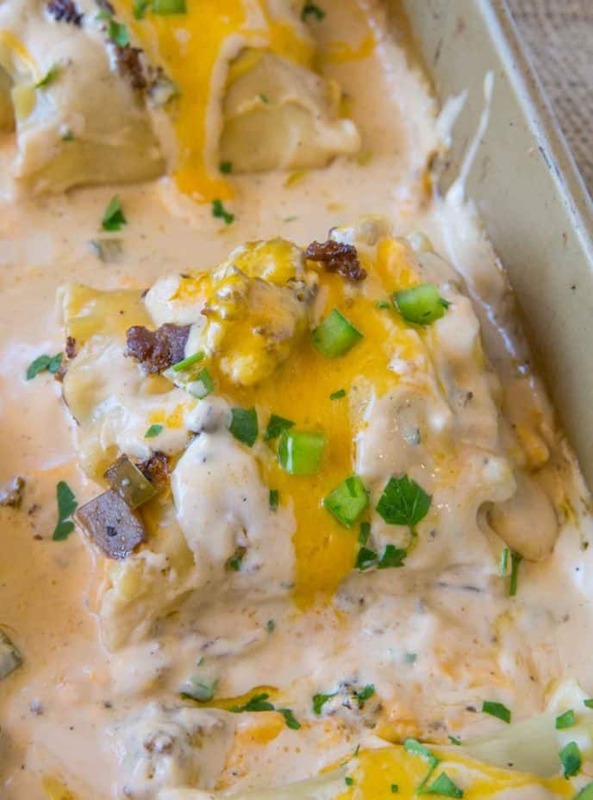 We love these rolled lasagna servings for 1 because they’re easy to serve and to freeze. We love to triple this recipe (2 boxes of lasagna sheets should do the trick for this) and serve them up when we’re having a craving. First using a spatula move the lasagna roll to a foil pan. Add 2-3 tablespoons of milk to the remaining sauce and whisk together. Pour the sauce over and around the lasagna roll. Bake at 375 degrees for 10-15 minutes or until cheese is melted and food is hot throughout. Make sure you cook the noodles a minute shy of the box directions, this helps keep the shape after baking. Don’t use the no boil noodles, since you have to boil them they’ll become mushy and the ruffled edges of the normal variety help keep the filling in. Bake covered before removing the foil to brown. You don’t want the noodles to get too crispy since they’ll be exposed and not swimming in sauce. The more you fill the harder to roll and leave at least 2 inches at the end without filling to complete the roll. I reserve about 1/4 cup of the filling to top after it comes out of the oven for presentation. Totally doesn’t matter if you don’t care about that. Since all the ingredients are baked we are putting it in the oven to cook long enough to melt the cheese inside then uncovering long enough to brown. Make your filling and sauce ahead of time and you can put the meal together in 30 minutes. Make the rolls ahead and freeze them in loaf pans for individual servings or in 8×8 foil pans for a quick dinner. Looking for more cheesy pasta options? Lasagna Noodles: Make sure you buy this variety and NOT this one. It makes keeping the filling in much easier. Baking Pan: Easy to use, doesn’t warp, freezes well and has high enough sides you don’t have to tent it when you add the foil. 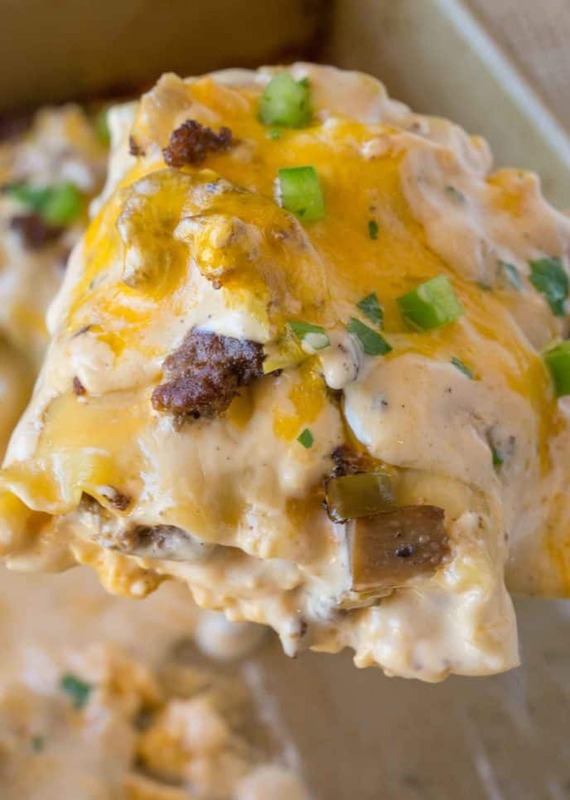 Philly Cheesesteak Lasagna Roll Ups with a beefy bechamel sauce, ground beef, cheddar cheese, mushrooms and onions for a new cheesesteak you'll love! Remove the beef mixture from the pan to a large bowl while you make the sauce. Add in 1 cup of the cheddar cheese a little at a time while whisking for 3-5 minutes or until thickened. Spoon over small amounts of the sauce (not enough to spill off the noodles). 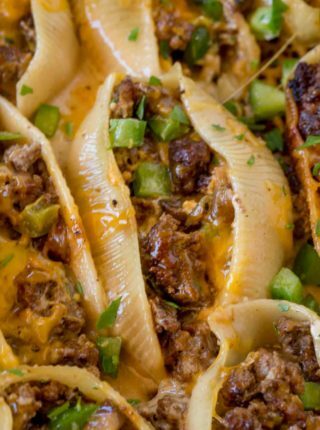 Top each one with 2 tablespoons of cheddar (1 cup for the 8 noodles). Roll the noodle somewhat tightly starting on the side with the filling. Place the rolled pasta in a 9x13 pan and cover with the sauce. * If you'd like to make the lasagna rolls a bit fancier save some of the filling for the topping and sprinkle some on after the last bit of cheddar cheese. OMG! This dish has all the flavors I love! That looks perfect! I’m going to have to try this. These look incredible! Such a good idea and great combination of flavors! This is a genius combination! So delicious! 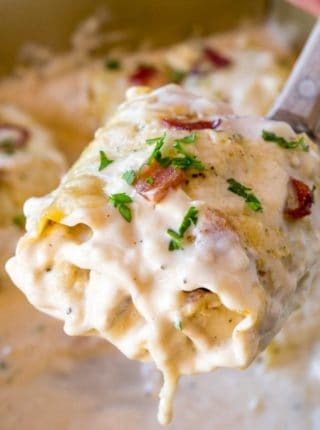 One of the best ideas for lasagna roll ups! 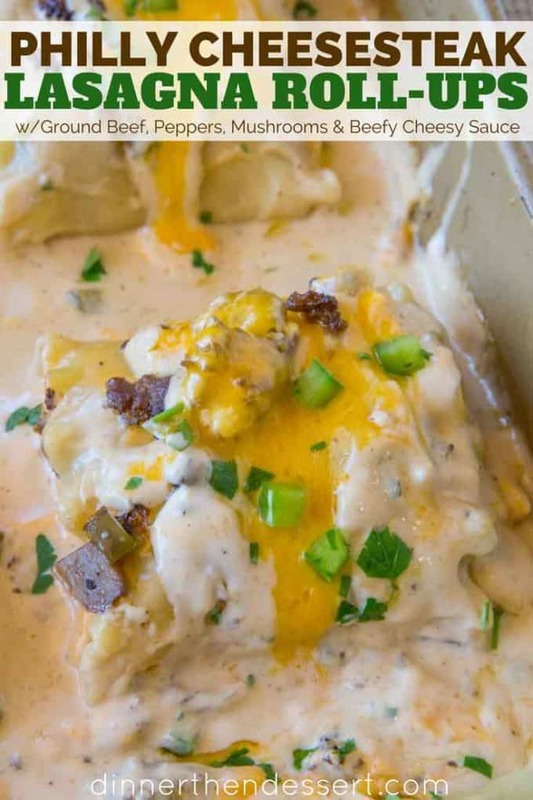 What a fun and delicious dinner idea!